A map of the miniature railway dated 1951: The shortened route. In 1948 Mr Charles Vimpany proposed to run a miniature pleasure railway at Stokes Bay for the Summer seasons over three years. He approached Gosport Borough Council, who agreed to the proposal. The managing company was formed as Southern Miniature Railways Limited, which also had railways at Poole, Bognor Regis and Southsea. The company was incorporated in June 1948 with the object to: ‘acquire and carry on in particular the business of miniature railway owners and operators heretofore carried on by Frederick Albert Tubbs, George Vimpany, William Ernest Simmonds and Louis Hathaway at Gosport Hants’. In May 1948 the Open Spaces and Cemeteries Committee recorded in its minutes that a Council expense of £50 would be provided to lay a water pipe from Promenade Cafe (Bathing Station) to the brick building at rear of the Admiralty control building (D Day Command Centre). It would also pay for two labourers for two weeks to prepare site for the railway tracks. The brick building was to be converted to a railway shed and station etc. The Council was to take 25% of the gross receipts in first year; fares were 6d per child and 1s per adult The Company would supply the engines and rails whilst Gosport Council provided the land. The railway ran from the rear of the bathing station, westwards towards Fort Gilkicker, looped around the pond known locally as the Cockle Pond or Paddling Pond and then back to the engine shed behind the bathing station. 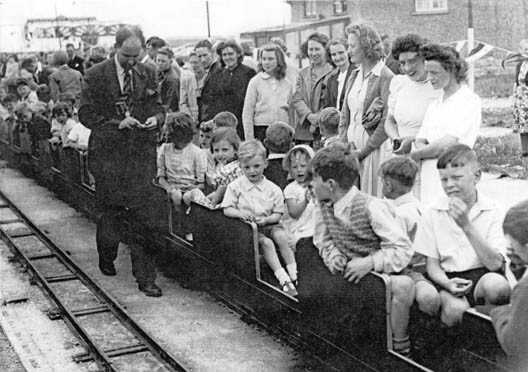 In January 1949 the Open Spaces and Cemeteries Committee minuted that Stokes Bay Miniature Railway was to operate again in 1949. In December 1949 the Railway Company agreed to shorten the railway to allow development of the site. The Committee noted that it was running at a loss but agreed to give it one more year. The route was shortened and the loop made smaller. 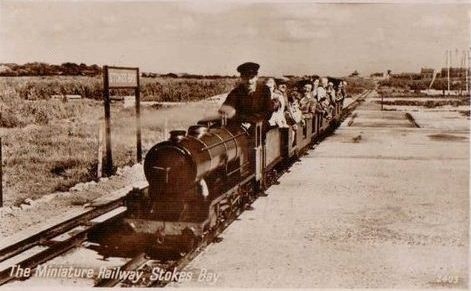 In February 1951 the Committee minuted that Southern Miniature Railways was to remove the miniature railway at Stokes Bay; it had run at a loss for 3 years but it hoped to return when ‘Stokes Bay regains its popularity’. The engines were moved to Poole, where the Company had another railway. The track was lifted and the land was used by the Stokes Bay Sailing Club, who wanted to expand their premises. Today nothing remains of the railway except for the building, used as the railway workshop, which still stands inside the Sailing Club compound. The line was 10.25-inch gauge. The engines were Vanguard and Valiant numbered 1001 and 1002, both built at Southsea. In 1990 the engines Vanguard, Victory and Valiant were bought by Stuart Ravell. All three are still running at Kirby Green Light Railway.Watermill Farm, Sleaford.